This volume explores recent advances in the use of pluripotent stem cells (PSCs) and adult stem cells (ASCs) in basic and clinical applications. The chapters discuss use of PSCs for drug screening, genome editing, modeling of kidney, motor neuron diseases, and diabetes as well as their application in cancer; ASCs are discussed in the contexts of banking of umbilical cord stem cells, use of multipotential stromal cells (MSCs) for bone repair, cellular interactions during fracture repair stages, and therapeutic applications of neural crest stem cells and lung stem cells. 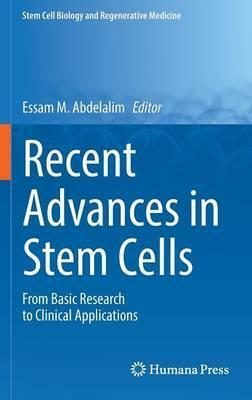 The text is organized by sections dealing with PSCs and ASCs specifically, presenting the reader with a comprehensive examination of both these forms of stem cells. Expertly authored and drawing from a wealth of international perspectives, Recent Advances in Stem Cells: From Basic Research to Clinical Applications presents a succinct yet detailed review of cutting-edge research in this rapidly expanding field. This installment of Springer s Stem Cell Biology and Regenerative Medicine series is essential reading for academics, researchers, and clinicians in the fields of cell biology, genetics, nephrology, osteology, oncology, and pulmonology."